Pies and breads and sweets in preparation for the big day on Thursday. You’d think we were having an army over for dinner and not just the four of us. But it sort of mushrooms – you think “oh, I’ll just bake a simple meal.” and then someone asks “but you’re going to make this, right?” and you say “yes, of course!” and pretty soon you have a feast on your hands. But that is part of what Thanksgiving is about, right? Feasting? Well, it’s become that, anyway. It’s really supposed to be about GIVING THANKS for all the blessings we have, but somehow it has turned into a day about eating. But, I’m OK with that, as long as we remember to be thankful for the fact that we CAN eat all this food and that we are so BLESSED to have an abundance of food to select from and eat. Pecan Pie (one of those things that just popped up on the menu, unbidden but welcome) I’m trying this recipe from Tasty Kitchen because it seems very, very close to the one my mom makes. 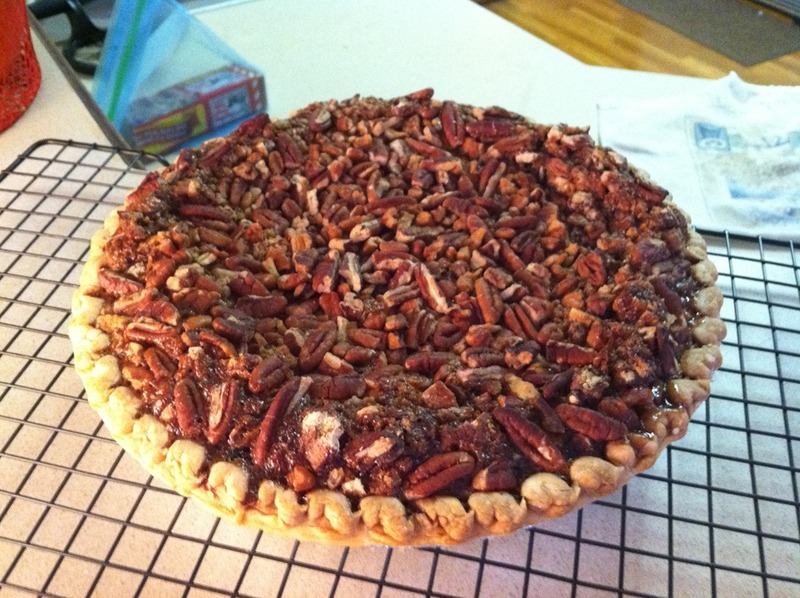 I used a combination of spiced pecans and plain ones. I saw that on Food Network this past weekend and thought it sounded like a really good idea. Well, this one is not baked, but I’m making it today. I’m also making it with sugar-free pudding, sugar-free cool whip and no-sugar-added pineapple so that it will be WLS friendly. A girl’s gotta have dessert, right? Honey Oatmeal Bread – this is just because I haven’t made any fresh bread in a couple weeks and I thought I’d try a new recipe and see how the family liked it. I’m also planning to bake a mincemeat pie this evening, but I’m cheating and using a jarred filling. It is what my mom always makes and I love it. For Thanksgiving morning, I’m planning to make these for breakfast. Mom made them a few weeks ago and said they were really good so I’m going to give them a try. That’ll be enough baking, I think. Don’t you? Tomorrow I’ll share some of the savory recipes we’re planning for Thanksgiving.